Hello everyone! It's me, Andrea, here today, and I want to share with you all a quick little review of our Fairytale Christmas Workshop that we had in December. It was so wonderful and magical and just filled with so much fun and creativity! I had such a wonderful time and I was so pleased to hear from the ladies that attended the workshop that they really, really enjoyed themselves as well! So for those of you who don't know, whenever we can, we try, here at the Fairytale Club, to host fun events and classes for our awesome Fairytale Club Customers. 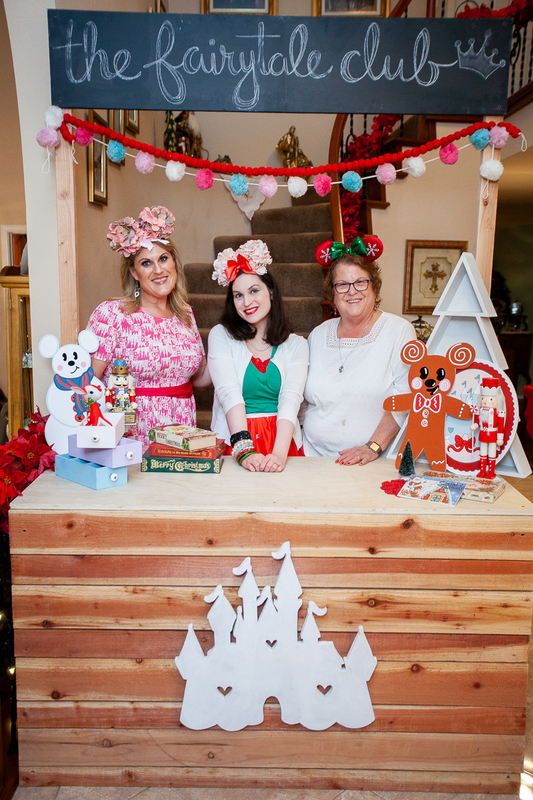 We have done events at Disneyland in the past and we have done springtime events and Halloween events...but this time we thought we would try to do things a little bit differently and we decided to host a Christmas Workshop in Diamond Bar, CA and have a couple of classes with a couple of really awesome papercrafting projects for our guests to work on while they enjoyed a Fairytale themed Christmas party with yummy food, lots of prizes, a photobooth, and of course, an awesome Disney Christmas kit that was made especially for the event! The kit that I designed for this event, as a specialty kit/collection, is called "Christmas-land" and is all about Disneyland at Christmastime! It is so beautiful and filled with so many fun Disney-Christmas goodies like cute pics of Mickey and Minnie under the mistletoe, a Holiday version of Small World, and Santa with a Mickey Mouse hat on! Each person at the Christmas Workshop received this very special kit with all the pretty 12x12 patterned papers and 6x8 decorative pages, and the cute embellishments like the ephemera pack and the variety pack and decorative paperclips! In addition to all those goodies, they also each received some chipboard covers and binder rings to build their Disney Christmas mini-album with (the first class project we worked on during the Workshop), and a white chipboard memorydex box (which was for the second class project). We all had the greatest time in both of the super fun Christmas classes that I and Carolee taught for the Workshop! We worked on my Mini-Album class first and then we moved on to Carolee's Memorydex class. In our classes we showed the ladies some fun and different ways to document the Holiday season! And we gave them some great tips and tricks to creating and decorating their mini-albums and memorydex boxes for Christmastime! During the Workshop, while we crafted, we chatted and we ate and played Disney trivia and gave away prizes! It was such a fantastic time! Everyone walked away with at least one prize, if not more (and there were so many cool prizes -- disney prizes, scrapbook prizes, planner prizes, decorative prizes). And the Disney trivia game that we played to give the prizes out was so much fun and so funny -- some girls thought the questions were hard, other Disney experts in the group thought it was easy, but everyone got the answers right (with a little help here and there sometimes from friends :-) ) and everyone laughed and had a great time and everyone was a winner! Which is the best kind of game -- one where everyone wins! Oh, and I have to talk to you about the photobooth! Our photobooth that we set up for the event was absolutely fantastic! It was our Fairytale Club Lemonade stand and we filled it with lots of pretty Christmas decorations! And we also had some really adorable decorative enlargements of some of our Disney Christmas pieces from our "Christmas-land" kit (like the Snow-Mouse and the Gingerbread-Mouse)! The decor for the booth, and really the whole party, was vintage and Disney and Christmas themed and it was all so beautiful! There were trees and wreaths and garlands everywhere and cute little touches like little vintage reindeer and vintage Mickey Mouses here and there! It was all very, very cute and oh so magical!!! It was truly a Fairytale Christmas workshop!!! Alright, well I hope you have enjoyed this fun review of our Fairytale Christmas Workshop that we had in December. It was such a fun event with such cool classes and projects and such a lovely group of people that attended too! It was just wonderful! Thank you to everyone who came to our Workshop and tomorrow we will be sharing some more up-close pictures of the magical Disney Christmas projects that we worked on in the classes so stay tuned for that too! 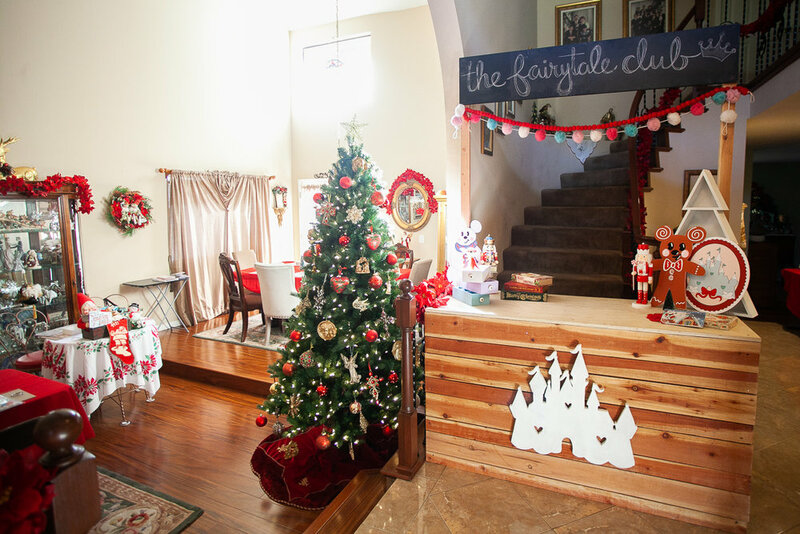 And stay tuned for more of our Fairytale Club Christmas wrap up this week!